House of Anansi Press introduced its first app this week, bringing six Massey Lectures to the iPad format with multimedia content including video interviews and discussion questions. 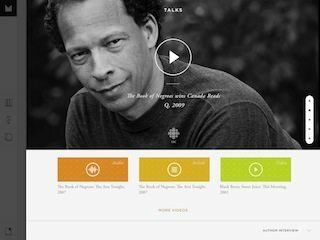 The app’s release coincides with the rebroadcast of Lawrence Hill’s 2013 lectures, Blood: The Stuff of Life, on CBC Radio’s Ideas program. The Massey Lectures app can be downloaded via iTunes. While the app is free to download, an in-app purchase of one lecture ebook ($14.99) or curated bundle (three titles organized under one of seven themes for $39.99) grants users access to the full video and text of the lectures, as well as interactive discussion boards and a notes and bookmarks feature. Critical Mass marketing agency CEO Dianne Wilkins, who serves on Anansi’s board of directors, conceived of collaborating on the app, which was funded with the support of the Ontario Media Development Corporation. The agency’s design team worked with featured lecturers Hill, Thomas King, and Stephen Lewis to develop discussion questions and themes for the bundles. Lectures by Neil Turok, Margaret Atwood, and Margaret Somerville are also included in the app, which will be updated regularly with additional content. Critical Mass executive creative director Jon Toews says the app was designed to enhance the experience for new and old fans. “Ultimately, our goal with the iPad app was to show that time spent with the Massey Lectures is time well spent, he says in a press release.